Once upon a time, in college, I tried to join a book group. I only made it to one meeting because my schedule was too busy and the books were largely written in another language (my paltry Spanish just wasn't prepared for that). But ever sense then, I've wanted to be in one. So this past summer, I put out the vibe to see if anyone else around town would be interested in a co-ed, post-college, pre-babies twentysomething book group. It turns out I'm actually not the only book nerd in Decatur who fits into that category. So the Catch-All Book Group was born. And I've been so happy and excited about all of our meetings! Like all the other book groups here at Little Shop of Stories, we meet to discuss a different book each month. Unlike all the other book groups here, we drink wine and beer while having the discussions...one of many the perks of being a twentysomething instead of a middle schooler. A lot of times the drinks and food are homemade because we have some brewers and bakers among the members. I love the mix of people that come to the meetings. The members are quirky, smart and inclusive (We had four newcomers at our last meeting!) They have no problem admitting when something in the text is unclear, or when they disagree with something. And they're all funny so we spend a lot of time laughing, even when the book is serious...like our last book. 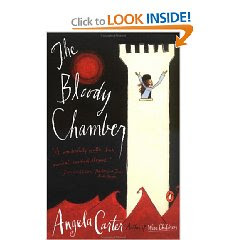 Last night we met to discuss Angela Carter’s dark and creepy The Bloody Chamber. Are you scared already just by the title? This collection of short stories is a smart compilation of the fairy tales you know and love from childhood—Red Riding Hood, Beauty and the Beast—but told in distorted, sensual adaptations. I'd go into more detail, but this is a blog for a children's bookstore so I'll keep it rated PG. But if you're looking for something different that will make your eyebrows raise (and make you blush), and you don't mind a little blood, try this one out. Next month we're reading something a little softer and a little sweeter: Listening is an Act of Love. Tune in for more information on this book with a post about it from Diane. And if you feel like being a part of our fun and eclectic group, email me at littleshopofstories@gmail.com for more info and join us here at the shop on the second Monday of each month at 7 pm. And I promise, everything we read is in English.